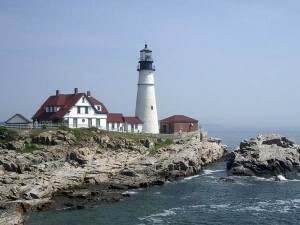 You may also want to view our newer article, Touring Maine Lighthouses (with Lighthouse Map). These and other questions are routinely asked by guests at Brewster House Bed & Breakfast in Freeport. A couple of years ago we wrote an article introducing some of our favorite lighthouses, and our Maine lighthouse map. As you can see from the small version of the Maine lighthouse map, above, there are actually a number of lighthouses not far from our Freeport Maine bed and breakfast. The nearest ones you can see are off the coast just a little north on US-1, and can be seen from Harpswell Neck or from Bailey Island’s extreme end (called Land’s End), but neither is accessible without a boat. A bit farther up US-1, turning toward the coast from Bath, Maine, there are several small lighthouses along the Kennebec River, and can be seen from either side (from the road to Phippsburg, Maine, or from Georgetown Island), and then there are more lighthouses on islands offshore. Similar to the smaller lighthouses elsewhere, Portland Harbor has two small lighthouses that can be visited, but the lighthouse most want to see in the Portland area is Portland Head Lighthouse. Commissioned by President George Washington, the lighthouse is the oldest in America, and is beautifully restored. The museum in the keeper’s house is very interesting, and provides wonderful insights into the life of the keeper, and area history. The park is a great place for a picnic, or to just while away the afternoon, watching kites overhead and sailboats on Casco Bay. You can only go up the tower at Portland Head on Maine Open Lighthouse Day, each year in September. 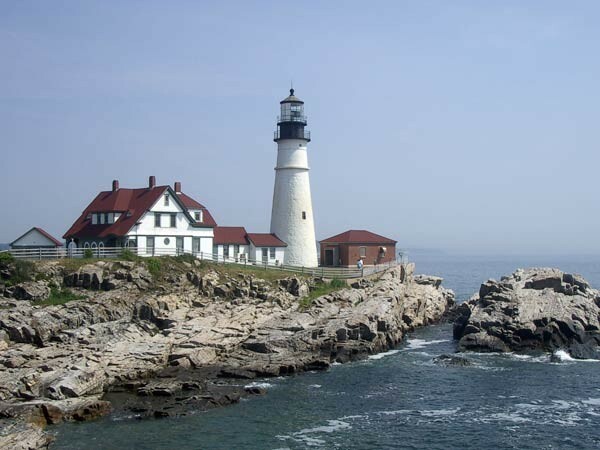 The nearest lighthouse where you can climb the tower is Pemaquid Point, near Bristol, Maine. It is about an hour from Brewster House, and is open whenever there is a volunteer available to assist you, seasonally. This lighthouse stands at the top of a rocky bluff, with ocean waves crashing on the rocks below, making a dramatic place to enjoy the lighthouse and the natural beauty of the area. As the map above indicates, there are many other lighthouses to explore, and quite a few of them are not far from our bed & breakfast. In fact, our Lighthouse Tour special will help you find your way to several of them!